What sort of music do you listen to? Do you listen to country music a lot or does 80s music bring back nostalgic memories of days gone by? Regardless of what type of music you like, what period it comes from or how rare it is, online radio will have a station for you. To those who are new to listening to music online. 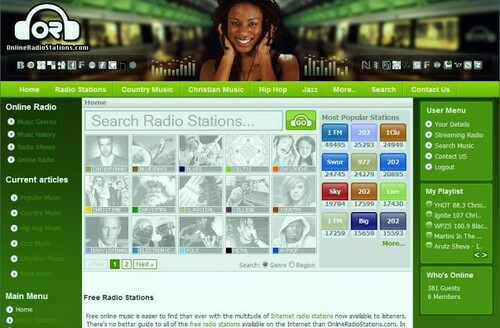 Online radio is the internet’s equivalent of your local radio station. Unlike the music being broadcast over the air, this is streamed directly to your computer over the internet. You can listen to this free music at any time of day, all you need is a browser and an internet connection and you’re good to go. These are real radio stations, and due to the global nature of both the internet and online radio, time difference means you can listen to active radio stations at almost any time of day. If you have a specific station you would like to listen to, even from the other side of the globe, you can. Since the music is streamed online, there is no issue of static or needing to have proper reception in your location. This is clean, high quality audio at its best and what’s more amazing that it is absolutely free. Go ahead and give it a try right now, you will not be disappointed.